Welcome to our Dancing Deer Baking Co. 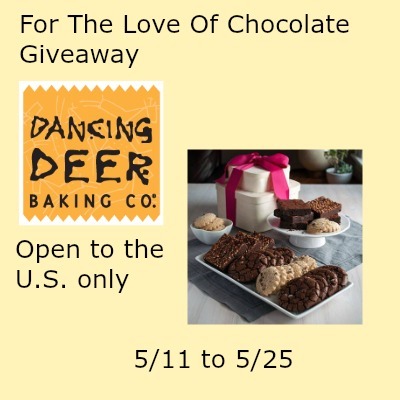 Sponsored By Dancing Deer Baking Co.
Everyone Loves sweets! Indulging in a brownie made with high quality ingredients and using a family recipe where they taste just like homemade is the real treat. How many times do you buy brownies only to have then taste like store bought? You really need to try Dancing Deer Baking Co.’s brownies and cookies. You can read Tammie’s review post of the prize by going HERE. This Sweepstakes will end on 5/25/2015 at 7 p.m.
Disclosure- Finger Click Saver is not associated with any of the companies named above. No purchase is necessary to enter. Void where prohibited by law. The odds of winning are based on the number of entries received. Open to the US 18+ only. Confirmed Winner(s) (by Random.org) will be contacted by email. Winner(s) have 24 hours to respond before a new winner is chosen. No purchase necessary. Void where prohibited by law. The sponsor(s) will be responsible for product shipment to winner(s) of this giveaway. My blog is not responsible for product shipment/delivery nor did I receive compensation. Only 1 prize per household. This event is in no way administered, sponsored, or endorsed by, or associated with, Facebook and/or Twitter, Google, Pinterest. This disclosure is done in accordance with the Federal Trade Commission 10 CFR, Part 255 Guides Concerning the Use of Endorsements. Entrants must only enter with either one email address, IP address and/or Facebook account, anyone found violating these rules will be disqualified. It is at the sole discretion of the admin of the giveaway if the winner has met the rules or not. My favorite guilty pleasure is a banana split with whipped cream and chocolate syrup! My favorite guilty pleasure is Peanut Butter Cups! I wish I had your will power! Soda – Coke specifically – is my downfall every day.